He [Raven] put on his two yellow-cedar blankets and walked among them. And they did not see him. Then he went into the chief’s house and to the right. It had ten tiers of retaining planks. On the upper one, in the middle of the sides, one sat weaving a chief’s dancing-blanket. Haida houses were monumental constructions—massive posts and beams, walls planked with cedar, roofs made of bark slabs, and sleeping platforms that ranged in tiers around a deeply sunken central hearth. A smoke hole in the roof gave ventilation and light. On many houses the entryway passed through the base of a pole that displayed clan crests. Crests shown on the model include, from top to bottom, Grizzly Bear, Raven stealing the moon, Beaver, and Mountain Goat. 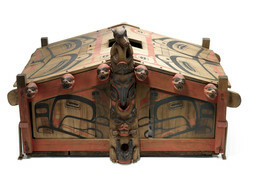 Artists made miniatures of actual houses for museum collectors, and this one may represent Grizzly Bear House at Skidegate.